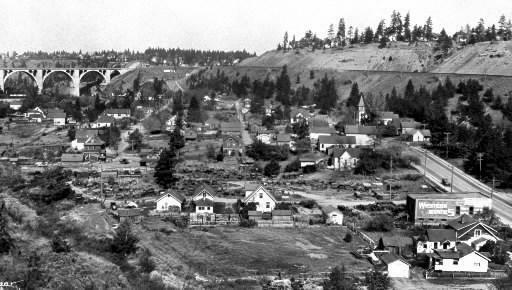 The area known as Vinegar Flats has a diverse history and was once home to local tribes, pioneers from the East coast, as well as new immigrants moving into Spokane. As early as 1874 there were small farms and orchards springing up with apple and peach trees hanging with fruit. Joshua R. Stafford had recently moved from Ohio in 1881 to homestead this modest portion of the growing city. He started out farming but quickly moved into real estate and platted the township known then as Stafford’s Addition. But it wasn’t until almost ten years later that the area was finally mapped and given the name we know it by today. Businesses moved in, including mills and brickmakers, and in 1888 F.G. Hieber opened his first brewery though he later moved to a larger building in Spokane. The name Vinegar Flats gained currency when in 1890 it became home to a vinegar factory and the pungent smell permeated the entire area. The Keller-Lorenz Vinegar Works used Hieber’s leftover brewing equipment, and employed locals and newly-arrived Chinese workers. When the factory began operations in 1890, vinegar was especially important for the preservation of a variety of foods. In an era before household refrigeration, pickling in vinegar was a common method of preserving fruits and vegetables. 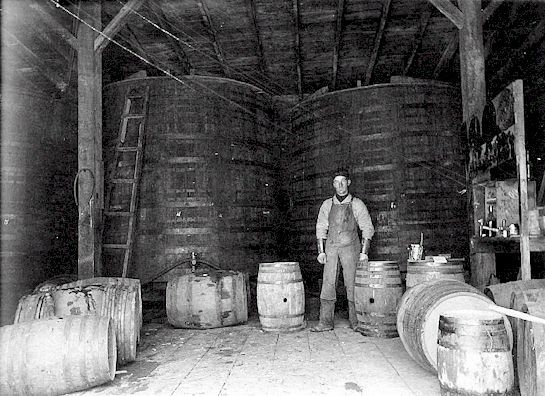 The Vinegar Works operated in the three-story building at 11th Avenue and Spruce Street until 1958 producing cider, malt, and white wine vinegar. It wasn’t until the 1930s that refrigerators became commonplace and the need for pickling foods became less important. This new era of both commercial and domestic refrigeration, coupled with better roads for transportation, meant that factories like the Keller -Lorenz Vinegar Works eventually went out of business. Although the settlement flourished, it never really outgrew its humble beginnings. Today, the valley is still somewhat of a hidden jewel surrounded by beautiful countryside with local farms and walking trails dotting the landscape but sections of the cement floor and red brick walls from the old vinegar factory can still be found. Joanne Percy, “Vinegar Flats - The Keller-Lorenz Vinegar Works,” Spokane Historical, accessed April 21, 2019, https://spokanehistorical.org/items/show/691.